In 2013, ground broke on construction of Sky City tower in Changsha, China, amid a flurry of worldwide attention. 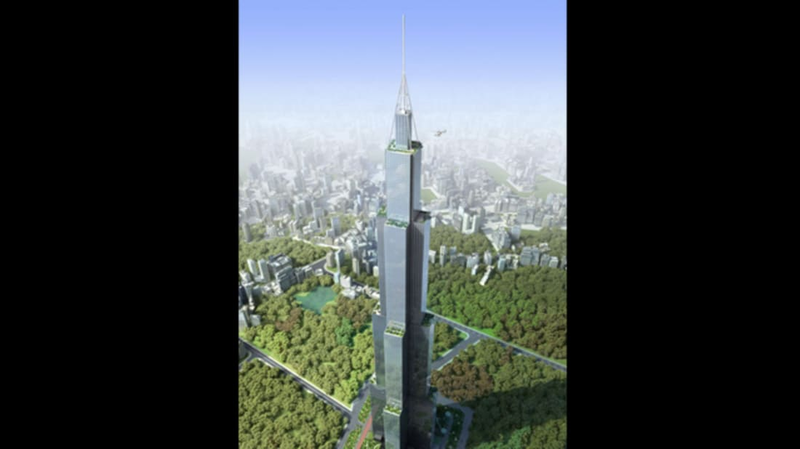 The skyscraper was set to become the tallest in the world at 2749 feet in a record-breaking 90-day construction time, aided by prefabricated building components. Billionaire Zhang Yue, the president of developer the Broad Group, arrived in a helicopter to commemorate the beginning of the project. But within a matter of days, the wheels of progress had ground to a halt: Construction was put on hold due to pending safety examinations and government building permits. Two years later, reports from the local Xiaoxiang Chen Bao and the South China Morning Post say the 6-acre foundations are filled with water and being used by villagers for raising fish. Nearby, the road to the site has been repurposed for drying grain, and pits are being used for growing watermelons. The Broad Group hasn't been idle in the time since it halted construction on Sky City, either: The company completed construction on a building known as Small Sky City. The 650-foot building was finished in 19 days. It’s unclear whether construction will resume on Sky City anytime soon, but Zhang told the South China Morning Post in March that "[Construction] shouldn't be far away. We'll start soon and complete soon." If that happens, Sky City tower will surpass the 2716-foot high Burj Khalifa in Dubai as the world’s tallest building, but both will likely be trumped by the Kingdom Tower in Jeddah—a projected 3280 foot (at least) behemoth already under construction.